Emby Media Server has many client apps including: Kodi, Windows Media Center/XBOX 360 (MCE Extender), Android TV, Roku/Now TV boxes, Amazon Fire TV, some Samsung Smart TVs. This means when you copy DVD library to Emby media server, you can stream DVD movies with Kodi, WMC, Roku, etc. However, Emby will only playback Video_TS on a PC (Emby for WMC).The same goes for .iso rips of DVDs. So when you want to put DVD movies to Emby for streaming, you’d better convert DVD to MKV/MP4. Extracting MP4/MKV from DVD discs makes you stream DVD movies with Kodi, Roku, Android TV via Emby cause even though Emby supports DVD video-ts, its clients don’t suppot it. So how to rip DVD to Emby Media Server? You can use a DVD Ripper to help you rip commercial DVD discs to Emby Media Server. Here I recommend you Pavtube ByteCopy <review>. This DVD ripping tool is the most impressive, yet easy-to-use and covers all your needs regarding a program to rip bluray and DVD discs. It can easily rip any copy & region protected DVD to Emby Media Server in digital version. It outputs MP4, MKV, AVI, FLV, 3GP, H.265, M3U8, etc with original video quality so that you can stream DVD via Emby Media Server on Amazon Fire TV, Samsung Smart TV, etc. Thus, you also can use Pavtube ByteCopy to rip Blu-ray to Emby Media Server by decrypt Blu-ray AACS, BD+, up to MKB v61. Learn >> Plex vs. Emby With Kodi. How to Copy DVD to Emby Media Server for Sharing and Streaming? Insert your DVD disc into your DVD drive, run the best DVD Converter for Emby Media Server and click “Files” icon to load movie from DVD source(Disc, folder, ISO). Set your wanted subtitles and audio track from the drop-down box of “Subtitles” and “Audio” tab. The mac version isPavtube ByteCopy for Mac. Note: DVDs encoded with any region codes can be imported to rip and your Netflix rented DVDs are also supported. 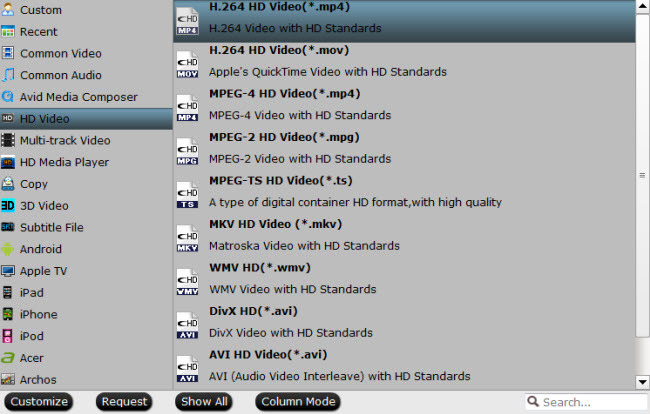 Click the “Format” option, and choose HD Video > H.264 HD Video(*.mp4) or MKV HD Video(*.mkv) as output format. MOV, MKV, AVI, etc can also be found in “HD Video” and “Common Video”. You also can choose other multimedia container/format from the profile. 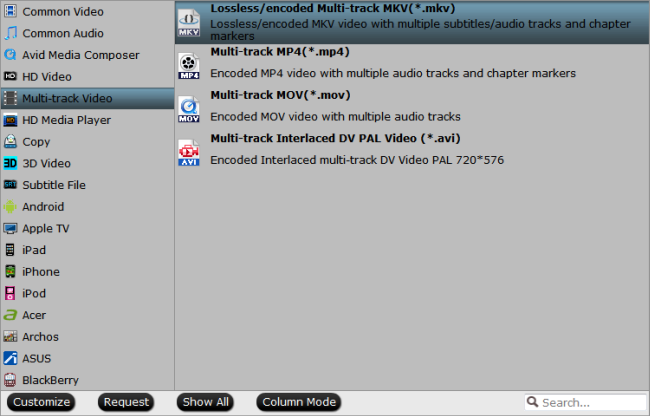 Note: If you want MKV files, you can choose lossless MKV from “Multi-track Video” to preserve the original video quality. Click the convert button under the preview window, and the DVD ripper will start the conversion from DVD movies to MKV/MP4 for Emby Media Server. Once the conversion ends, you can locate the generated MP4/MKV files in output folder. Put DVD rips into sharing folder of Emby, then you can stream the converted DVD movies through Emby Media Server to iPad Pro, Samsung UHD TV, Roku, Xbox 360, PS4 Pro, PS4 or other DLNA-compliant devices for watching. This entry was posted in Backup.